"And when I googled windmill I found there was million of applications! I said, where was this Google all this time?!" Re-inventing the wheel isn't something we would wish upon anyone but William Kamkwamba's story provides an example of the information disparity slowing down progress for the brightest minds. In Dowa Malawi Africa, William couldn't afford the US$80 per year it cost to attend school so he spent his time at the library instead. Over the span of four years he re-invented the windmill to provide himself with electricity. He shared his first google experience with journalists: "He said, "do you know Google?" and I said, what animal is a Google?" "And when I googled windmill I found there was million of applications! I said, where was this Google all this time?!" "You can multiply the effectiveness of 10 teachers by 100- or 1,000-fold if you give children access to the Internet." Dr. Sugata Mitra was trying to answer the question if children could teach themselves how to use computers. He cut a hole in his office and placed a computer through it. The Delhi street children flocked to it and soon had taught themselves computer skills as well as English. He expanded his operation to North Eastern India: He left a computer there with some cd's, for three months. When he came back the children exclaimed: "We need a faster processor and a better mouse" an eight year old asked. Dr. Sugata responded: "How on earth did they learn those words?" "From the CD's you left us!" The 6 to 13 year olds had learned over 200 English and were using them in their day-to-day conversations. Currently there are over 300 learning stations covering some 300,000 children in India and some African countries. Remoteness affects the quality of education. Educational technology should be introduced into remote areas FIRST. "Communication issues constitute 50% of UNICEF's 10 Challenges. Improve communication and the other challenges will be easier to overcome." In South Africa a carrier pigeon named "Winston" flew data between two offices faster than broadband Internet could transfer the data. Durban-based Unlimited IT sponsored a 60-mile data transmission race between a pigeon carrying a 4GB memory stick and the ADSL service from the country's biggest web firm, Telkom. The pigeon won. "Winston" took one hour and eight minutes to carry the data 60 miles. In that time the ADSL had sent just four percent of the data. "We envision to empower our people through the power of information to enhance their quality of life and to be on par with their peers in developed urban centres and peoples of this world"
"If there was free bandwidth, don't worry about the computers; people find the money to buy them, you would be surprised. When the price of vanilla went up people showed up with bags of vanilla beans to buy Toyotas!" "Question Box was conceived as a way of overcoming both the expense and the scarcity of Internet connections." Open Mind's Question Box is taking the Internet's knowledge to rural villages through solar-powered intercoms connected to live operators who have access to the online world. "If local hens are fed on foreign feeds can they lay eggs well?" -Mbale, Uganda. A first step in bringing Internet access to the whole world, Question Box keeps people informed and aware. Its success in using the power of online begs another question, what would people do with Internet at their own fingertips? We believe that Internet access is a tool that allows people to help themselves - a tool so vital that it should be considered a universal human right. Imagine your digital life disconnected. Without access to the 100 million man-hours that have been put into Wikipedia, how much do you actually know? Without your contacts online social networks how much can you accomplish? Without access to the news, weather, your bank account-- how in charge of your life are you? HOW DO YOU PLAN TO BUY THIS SATELLITE? The Terrestar-1 satellite, launched in 2009, is as big as a school bus, connects to a tiny handset called the Genus, and proves that communication satellites can provide data services effectively. The company that owns that satellite filed for chapter-11 bankruptcy protection on October 19th 2010. 1. Finalize a business plan for large scale funders. 2. Process the legal and business aspects of submitting a bid for the satellite. 3. Hire several full-time engineers to make our calculations and planning into a concrete reality. While this work is in process we will meet with investors, businesses, governments, and foundations who are interested in funding the purchase of Terrestar-1. Partnerships will be created with the country or countries over which the satellite will be positioned. 1. Make an official bid for the Terrestar-1 satellite. 2. Begin development of an open source low cost modem. 3. Acquire an orbital slot (satellite parking spot) and spectrum (radio wave allocation). 4. Finalize plans with partner governments. 5. Continue all of the technical work required to reposition a satellite. 1. Move the satellite to a new orbit over our partner country/countries. 2. Distribute low cost modems. Totally simple right!? We're excited, and we invite you to join us in every step of this journey. WHO CAN THIS SATELLITE HELP? Easy - anyone without Internet access! Papua New Guinea (PNG) would be an excellent candidate. They have an orbital slot (a parking spot in space for a satellite), a terrible Internet penetration rate of 2.1%, and their prime minister has been trying to build a satellite to connect their people for a while. "We need to get information to them [the citizens] so they can think for themselves, better their own lives, and not rely on other people's dole." In Papua New Guinea six million people could be directly impacted. If we include Indonesia (Internet penetration rate: 12.3%) we could include another 243 million people. Then there's Africa. An entire continent of people who could find a voice. Let us know what YOU think. IS MOVING A SATELLITE EVEN TECHNICALLY POSSIBLE? Our engineers say yes, and we chatted with Terrestar a few months ago. 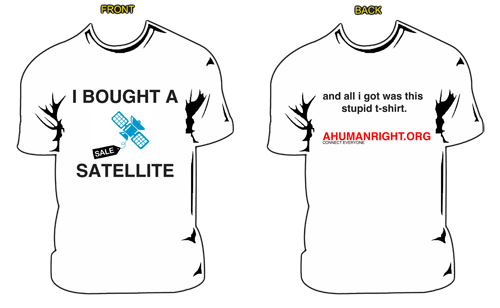 Ahumanright.org: "Is it possible to move your satellite into a new orbit and provide services to a different country?" Dennis Matheson Terrestar CTO: "Without revealing too much, yes we could. But I can't give you details." OK, IT ALL SEEMS SIMPLE ENOUGH. HOW MUCH? Our first phase requires $150,000- that is our fundraising goal. If we can raise more, we will be thrilled. At this time there is no specific price tag on this treasure. But consider the Iridium satellite constellation: it cost 5 billion dollars to build, and was sold for 23 million dollars after it went bankrupt in 2000. When opportunity knocks, answer the door. Although we believe in free Internet for the planet, there are some realities to face: like paying the rent. We will offer a diminished service for free to everyone, while allowing telecommunications companies to purchase and re-sell high speed bandwidth. Our goal is to not only get everyone online, but also facilitate the growth of an industry. As the CTO of Deutsche Telekom Thomas Curran advised us: "You're evangelizing for access, expanding it. That can only help the industry." And helping industry helps developing countries grow. We're building our own open-source low cost modem that will make getting online easy. Devices to get online are cheaper than ever-- India is building a 12 USD laptop. Cool loot is part of the deal! We're hosting a global summit on telecommunications, donate and you can join us. Join us in private brainstorming sessions with thought leaders and get all the VIP perks. *Why US Only? Unfortunately most of your donation would go towards shipping if we sent items out of the country. When is someone going to invent a teleporter?